tom (Homepage) wrote: Beautfil light and colors. engloy (Homepage) wrote: Cool patterns in the foreground and nice light! gavin hart (Homepage) wrote: Very beautiful scene captured here, Paolo. Tonal balance and exposure is excellent. The light is lovely and the hues are superb. The sunset, even though so distant, is exceptionally appealing. Mike Paulison (Homepage) wrote: Paolo, Paolo, Paolo... GORGEOUS again. The patterns in the sand and the colors are amazing. NJ & SB Photography (Homepage) wrote: que bella luz, el degradado es buenisimo y la composición vertical muy apropiada!! Pere (Homepage) wrote: Bonita composición y bellísimo degradado de luz y color. Las formas sobre la arena son muy hermosas. David H-W (Homepage) wrote: Strong shot with great foreground. Asgardr (Homepage) wrote: Excellent! The scale of things in this photo is hard to guess, which I think is a good thing! Sidney (Homepage) wrote: Nice patterns combined with beautiful light! joshi daniel (Homepage) wrote: nice and the foreground is very beautiful! Tom (Homepage) wrote: Nice shot. Again - looks unearthly. Laurie (Homepage) wrote: Excellent shot. This is quite stunning. Pedro (Homepage) wrote: Excelent framing, I like the stripes above. Regards. Joanna (Homepage) wrote: interesting composition, I like these lines. Turnbill (Homepage) wrote: Beautiful tones in this. Arnd (Homepage) wrote: Great colors and textures. Outstanding clarity. Michael Rawluk (Homepage) wrote: That is a wonderful shot. Frida (Homepage) wrote: Beautiful composition and colors. Susan (Homepage) wrote: Beautiful image and composition. vera (Homepage) wrote: good framing colors and ... sunset ! Jeff (Homepage) wrote: This is a nice sunset! That is a pretty interesting landscape too. Andy (Homepage) wrote: Really beautiful shot. Love your title it really fits this shot perfectly. Thomas (Homepage) wrote: WOW, that's a class image. The lighting, the details and the composition are gorgeous. 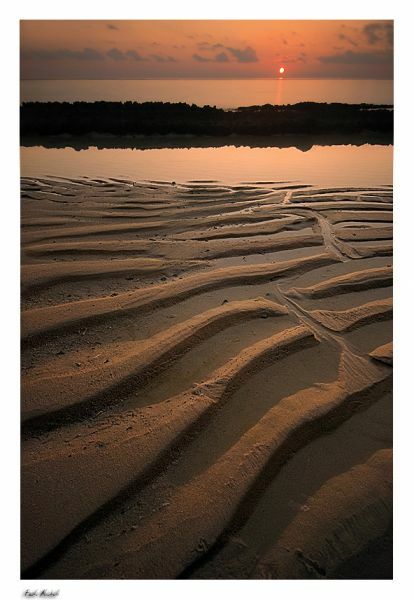 John Maslowski (Homepage) wrote: Beautiful landscape patterns and tones. Excellent angle for this shot, and love the layers in this composition. Marcie (Homepage) wrote: WOW! Love the textures and patterns in the landscape. Such gorgeous warm tones and colors!! beanow (Homepage) wrote: Paolo, Your paintings are more and more beautiful...You introduced the exquisite composition in the splendid colouring here...Congrats! Chris Curnow (Homepage) wrote: Such a peaceful composition. Nicki (Homepage) wrote: I think about the perspective, wide angle or "high" placed? Anyway - good point of view, thats what i like! Jose (Homepage) wrote: Very nice perspective for your sunset.